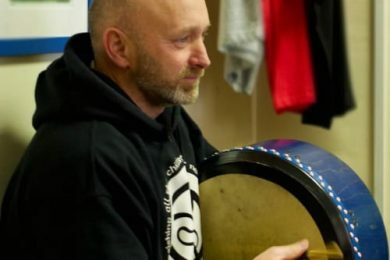 Brian Fleming specialises in traditional Irish percussion instruments, while also playing percussion from around the world. His playing has been recorded on thirty albums, he produced three of those, and played on several soundtracks for film and TV. He has played with many of the best known innovators in Irish music and dance, including Davy Spillane, Emer Mayock (Afro Celts), Anuna, Michael Flatley, Cormac Breathnach, De jimbe and Kíla. 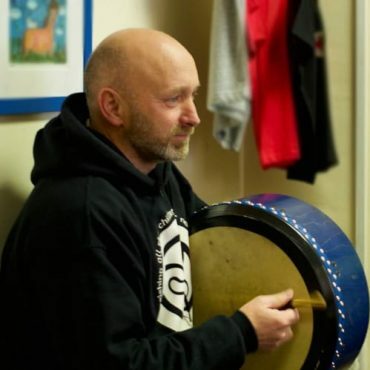 He has taught bodhrán and percussion in schools, music schools, universities and festivals all over Ireland and abroad. In fact, he has played all over the world, including notably Senegal, Gambia, at the World Drum Festival in Seoul and at the Opening Ceremony of the FIFA World Cup 2002 in Korea. He is even credited in the Guinness Book of World Records as one of the designers of the Millennium Drum, the world’s largest drum, built for the millennium Drum Carnival, which he directed. He is also co-director with Robbie Harris of the Big Bang Festival of Rhythm.